“MEETINGS are to take place between police and Muslim leaders after a Redditch mosque was attacked and racist graffiti, including swastikas, was painted on the building. The damage at the mosque in Jinnah Road was caused between 2am and shortly before 4.30am this morning, when it was discovered by a targeted police patrol. Graffiti including swastikas had been sprayed onto walls and at least six windows, using paint taken from builders’ cabins on the site, which is still under construction. Entry to the site was forced via a gate and the intruders then broke into the main building. It is not known at this stage whether anything has been stolen. Police have informed mosque representatives and are currently guarding the site and carrying out local reassurance patrols. Forensic examinations are ongoing. North Worcestershire police commander, Superintendent Kevin Purcell, said: “For as long as I can remember the relationship between the Muslim community in Redditch, the police and the wider community would best be described as excellent. “Due to incidents happening nationally targeted patrols have been put in place and these will now be further increased as we will not tolerate mindless attacks of this nature. Do you know man who racially assaulted taxi driver? SICKO! EDL Uses The Murder of Woolwich Victim For Thier Own Gain. Last night in a calm, considered and educated manor the EDL thought about its response to the brutal public murder, and botched beheading of a man going about his business in Woolwich, London….Not really, as you might expect from a group of reactionary right wing morons they set about making the most of the situation and used the murder as an excuse to dress up like terrorists and run around with plod. 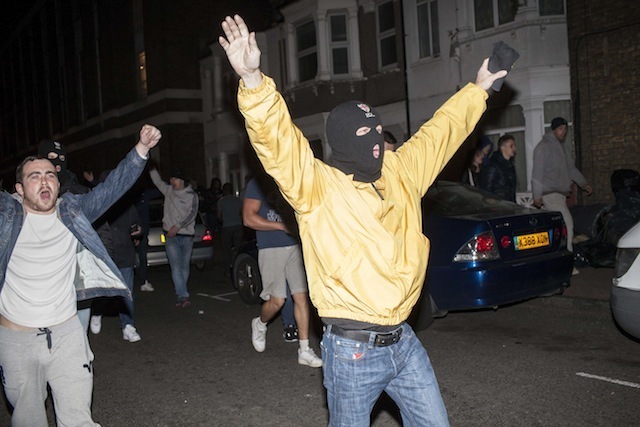 They got pissed, the celebrations got out of hand, and they ended up smashing up a pub before fighting with police. Vice magazine took some good photo’s of the pricks here – Vice pics. chance for a bit of racism. The EDL is really going to milk this horrible incident, giving the two murderers exactly what they wanted; divided communities. As has been said many times, the British far right (EDL etc) and lunatic religious extremists are two sides of the same coin. The religious extremists can’t get any support for their insane ideas from 99.9% of British Muslims, so they carry out a brutal murder and the EDL responds just as the extremists would like, they attack the innocent – ruining lives and communities, and trying to divide us in a way that the religious fanatics could never have done on their own. It’s lucky for the rest of us that the Muslim community is in general very thoughtful, and reacts to the threats with a dignity that the EDL followers will never know. There have already been incidents of attacks against innocent Muslim communities – in Essex a masked man walked into a mosque brandishing knives, in Kent a mosque was vandalised and in Bolton cars outside a mosque have been done over. One shitsack ‘patriot’ has been spreading lies on twitter that ordinary Muslims in Oldham were celebrating in the streets!?! 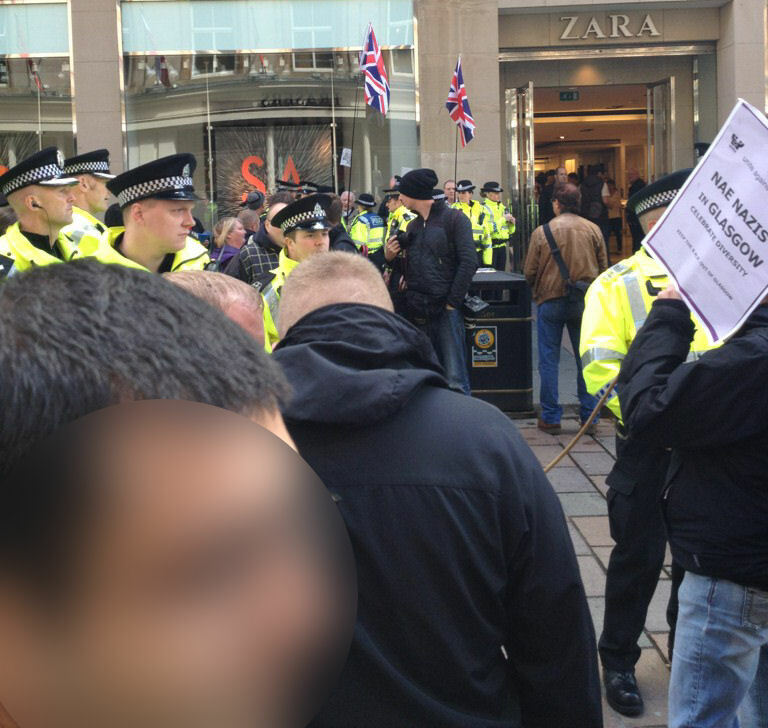 This lie was then spread by CxF and EDL until GM Police had to take to twitter to say it was a load of old cobblers. On BBC Radio Five a caller of Indian decent, with kids in the army, talked of how she did not feel safe with the EDL running around blaming all brown people. 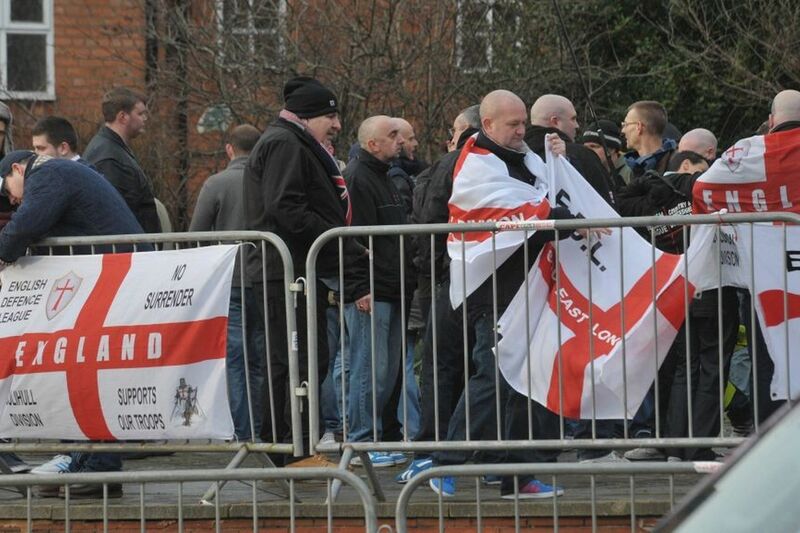 Other EDL divisions throughout the country who have been surrendered for some time are springing into life again to capitalise on the horrific murder. No doubt the Newcastle EDL organisers are rubbing their hands in glee, hoping that this death will boost their numbers at Saturdays protest. 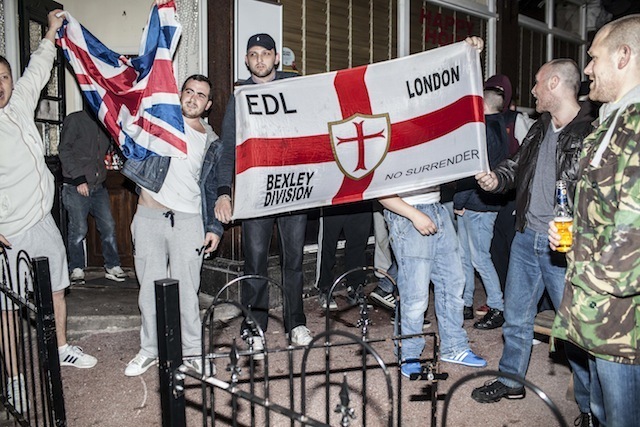 The EDL has called for a demo for bank holiday Monday outside Downing Street – presumably as the two murderers were sent on an all expenses paid cruise rather than being shot, uh? Time for London to unite and show the haters where to go! All Antifascists will be remaining vigilant over the coming weeks – to again try to stop the rot the far right brings to our streets, and using the upsurge in EDL facebook activity to gather intelligence on organised racism. YAY “we got what we wanted” Sick fascists, yesterday evening. Below is a statement from an AFN affiliated group, speaking on behalf of the Anti-Fascist Network. The Anti-Fascist Network deplores the murder of a young man in Woolwich yesterday and our condolences go out to his family and friends. We also deplore the use of this incident by the far right to stir up Islamophobia once again. By calling a ‘terrorist alert’ the government has shamelessly sought political capital from what was clearly an isolated act of brutality by a couple of lone psychopaths claiming to be Muslims. There are maniacs in every community and grouping, not least the far right. The loss of a life in such horrific circumstances is always a tragedy for those involved, just as it was when fascists killed Altab Ali or when the police killed Blair Peach. Meanwhile the Muslim community has conducted itself with dignity, and a huge number of individual Muslims have spontaneously taken to social media to disassociate themselves from any kind of sectarian violence. Unlike the EDL, now virtually a spent force, who have chosen to use this man’s death to go on a recruiting drive and encourage attacks on minorities. The Internet is now buzzing with ‘patriots’, nationalists and fascists eager to exploit the situation – please don’t encourage them by carelessly repeating their drivel. We will all need to be vigilant, and work with our communities against any rise in fascist activity. “This is a truly barbaric act that has no basis in Islam and we condemn this unreservedly. Our thoughts are with the victim and his family.We understand the victim is a serving member of the Armed Forces. Muslims have long served in this country’s Armed Forces, proudly and with honour. This attack on a member of the Armed Forces is dishonourable, and no cause justifies this murder. This action will no doubt heighten tensions on the streets of the United Kingdom. Photo’s in this article are taken by extremely good looking, talented photographers, who work with Vice Magazine , used without permission (sorry). “POLICE have raided the house of a UKIP politician embroiled in a race hate storm – as he confirmed his formal resignation as a councillor is taking place today. Officers from West Mercia Police have searched the Stourport-based home of Eric Kitson and seized his computer to gather evidence for a possible prosecution. The 59-year-old has not been arrested, but has been voluntarily interviewed about the saga of his anti-Muslim, anti-Jewish Facebook rants. He will formally resign as a councillor at 4pm today – despite only winning a seat at Worcestershire County Council 13 days ago. It means his spell at County Hall is the shortest of any elected politician in the authority’s history, and will trigger a by-election. A statement released on his behalf by UKIP said: “It is with sadness that I am announcing my resignation as a councillor. “I am extremely sorry to have let down my friends, the people in the hardworking UKIP team that got me elected, the people of Stourport, and of course my family. “Like many people who are not professional politicians I used my Facebook page a general post board. The UK Independence Party say a meeting is due in the coming days of its decision-making National Executive Committee, which is almost certain to revoke his membership too. He was outed over the weekend for filling his now-deleted Facebook page with a host of racist images and cartoons. Among the most shocking was a cartoon of a Muslim being spit-roasted on a fire fuelled by copies of the Koran. He also made comments referring to Muslim women, saying “hang um first then ask questions later” and called for the repatriation of “six million migrants and refugees”. West Mercia Police had received complaints from the public over the saga, and acted by searching his home last night. A spokesman said: “Eric Kitson, from Stourport, was voluntarily interviewed by officers from West Mercia Police over concerns raised by the public about allegedly offensive and racist comments made on social media. “A computer was seized and a property in Stourport searched by police for evidence gathering purposes. 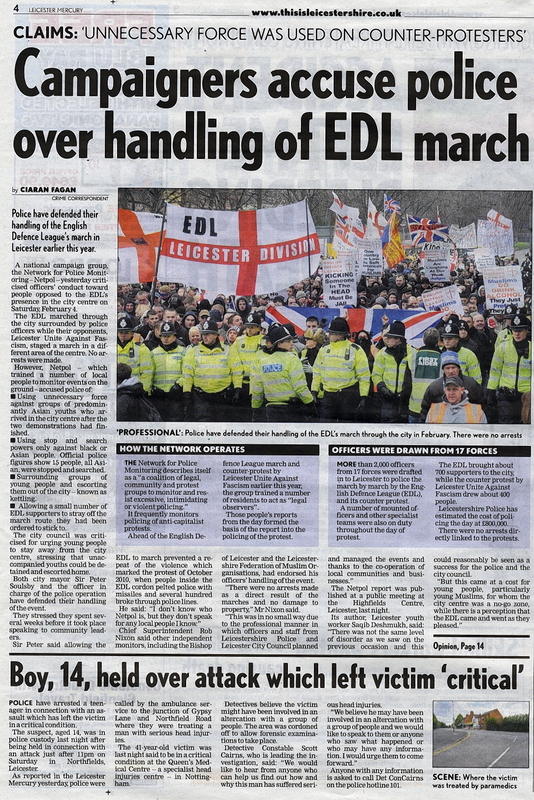 “Netpol has published a critical report into the policing of the EDL and Counter demonstrations of February 4th in Leicester. 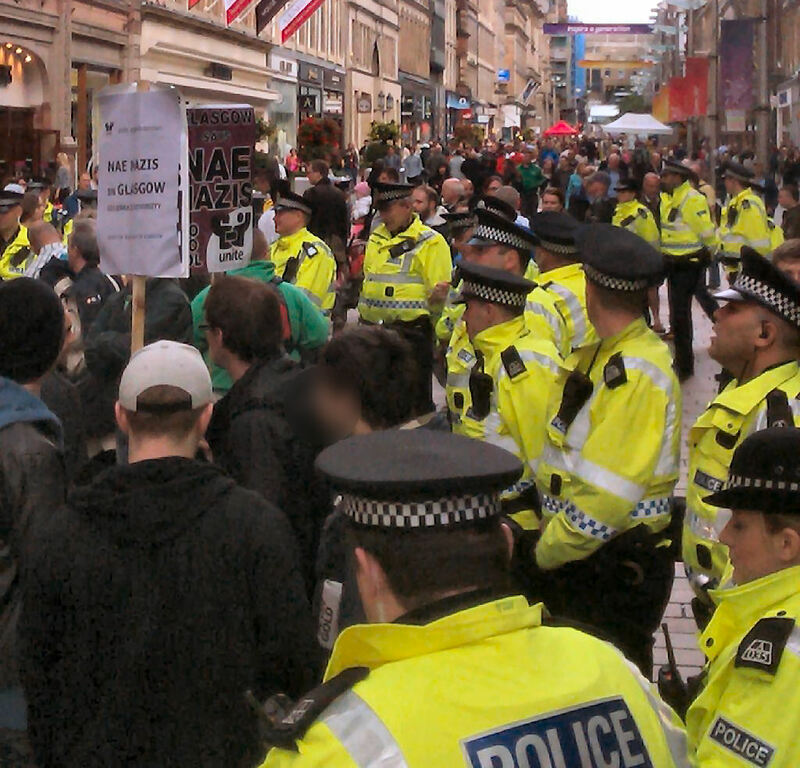 The report is a collation of the evidence and observations obtained by a team of community-based legal observers who spent the day monitoring the policing of both EDL and counter-demonstrations. 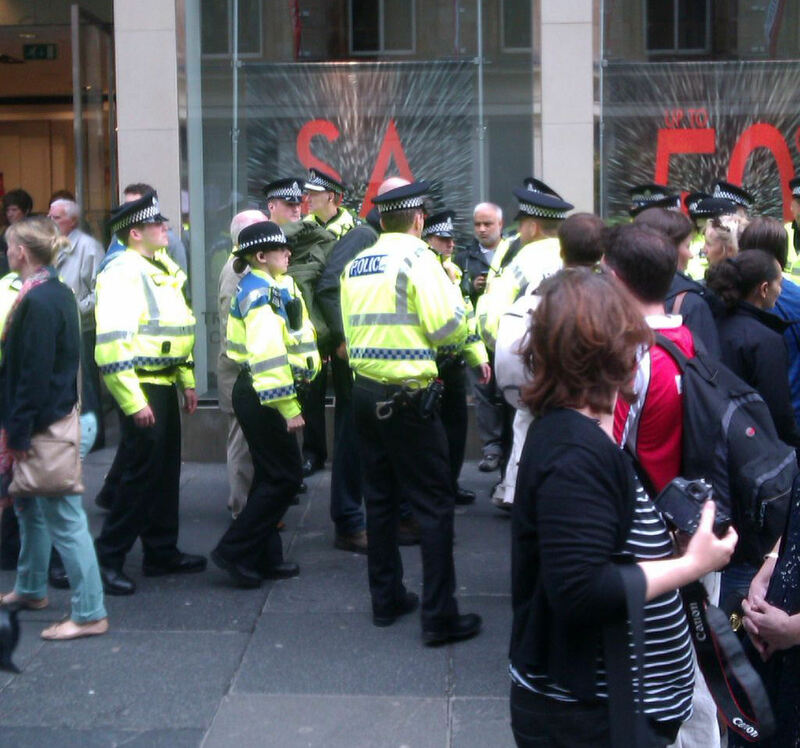 The legal observers deployed were local volunteers trained by Netpol with support from The Race Equality Centre (TREC) and Highfields Centre. There has been a great deal of interest in the media – from the local paper and BBC Radio Leicester, though not all of it was positive.